Arya recently found a new way to entertain herself. Unfortunately it also involves making a mess. 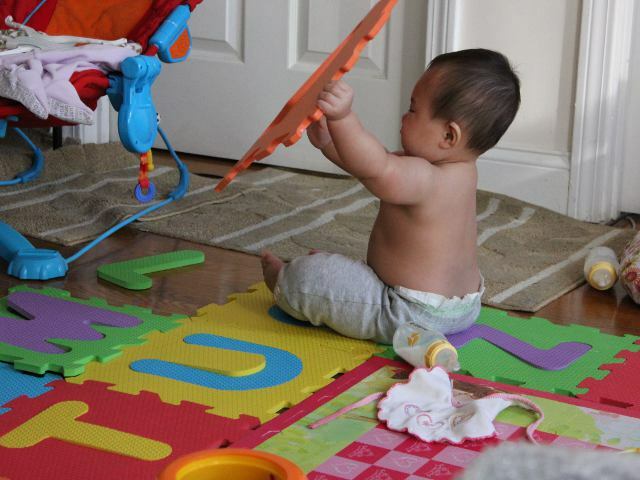 Baby likes to take apart her alphabet mat. Worse, she also likes to use the pieces as a soft weapon to move other objects. A few weeks ago she preferred to pick out the end pieces to use as teething toys. Now she goes after the large, square pieces so that she can wave them wildly around. 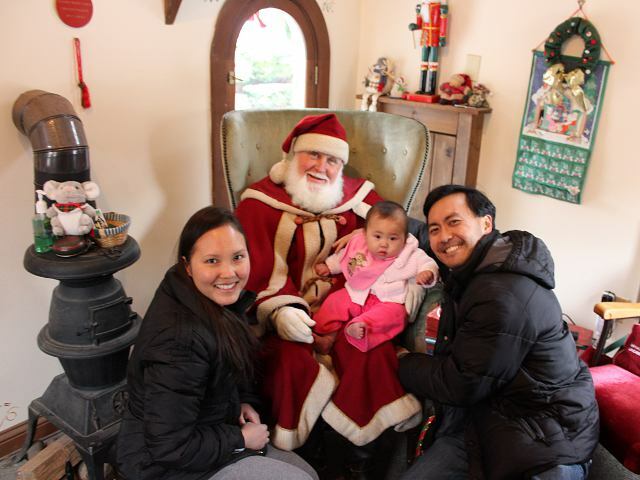 During our Thanksgiving road trip with baby, Arya had her first baby picture with Santa. Driving long distances with a baby is tough, so we purposefully planned to make lots of short stops along the route. One of our stops was in the small village of Cooperstown, New York. Cooperstown, which is best known as the site of the National Baseball Hall of Fame and Museum, lies a few minutes south of US Route 20 near Otsego Lake and makes for a good place to stop on a drive across the state. Arya has become obsessed with looking at other babies. Whenever we read to her she stares at the babies and constantly slaps at their pictures. 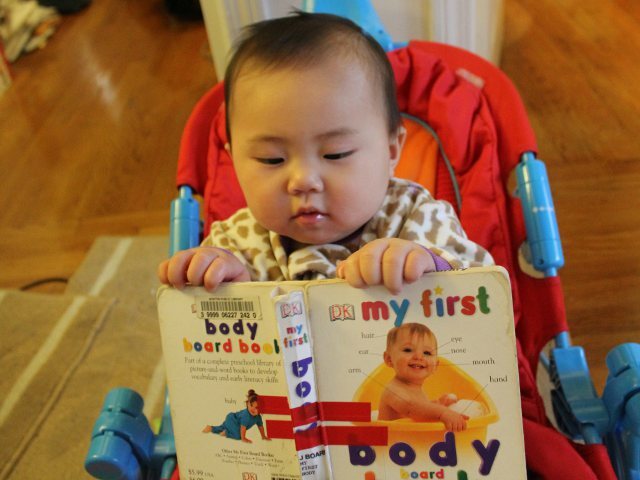 My First Body Board Book by DK Publishing is filled with pictures of babies in cute poses. I’ve seen many positive reviews for Karma Wilson’s most popular book. I have yet to read that book to my daughter, but I did find a similar book in Bear Feels Scared by Karma Wilson and Jane Chapman. The cover image, showing a frightened bear surrounded by his animal friends in the dark woods, sets the theme for the rest of the story. We’ve had trouble finding a convenient way to store all of Arya’s toys. Toy boxes, drawers, and even toy bags are too cumbersome to use on a daily basis. Finally mommy figured out that we should just serve Arya a plate of baby toys. With December approaching, I noticed a Christmas-themed book in the children’s section of the library. 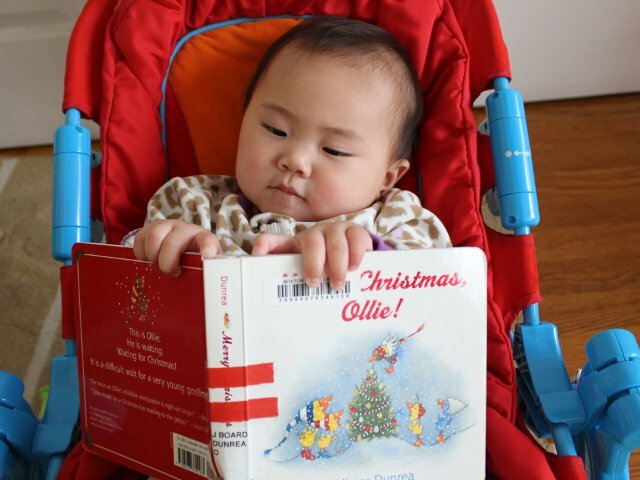 Merry Christmas Ollie by Olivier Dunrea seemed like an good choice to read to Arya. She enjoyed the previous books about Gossie and his friends and the colorful picture of the Christmas tree on the front cover caught her eye. Arya is a drooling baby. She started drooling around two-months old as part of her normal development. When she was younger Arya would drool constantly throughout the day. Now our drooling baby only drools when she is happy or excited. Although I remember reading lots of Dr. Seuss books as a kid, I don’t remember any books in the Bright and Early Board Books series. 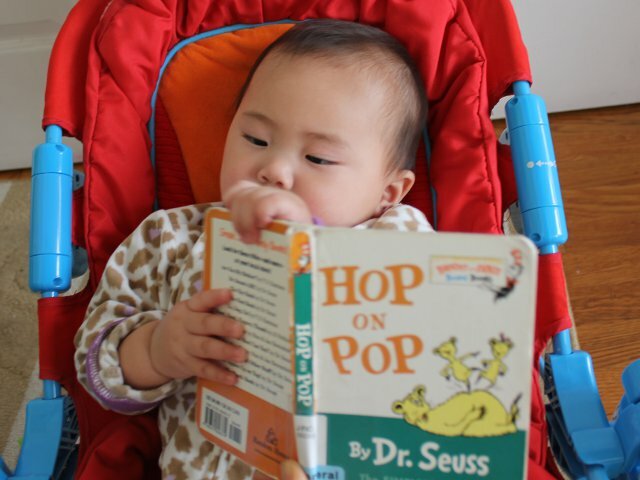 Hop on Pop by Dr. Seuss is one of the books in the bright and early series and is well designed for babies and young toddlers. The book includes references from other Dr. Seuss classics making it especially good for children soon to transition to other books. 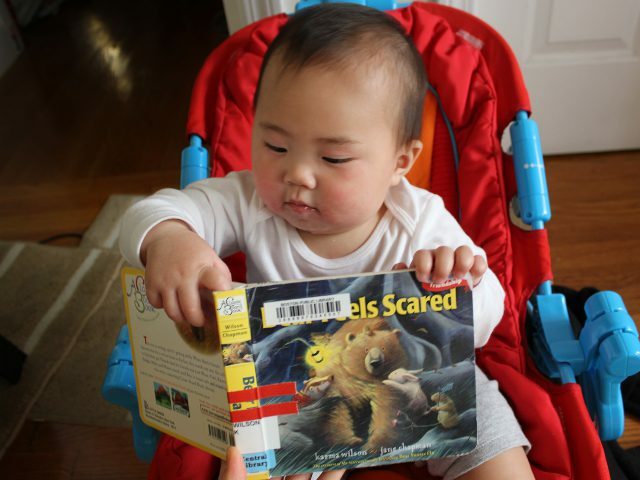 There is no shortage of counting books for babies. Most follow a familiar theme of showing a specific number of on each page while incrementally increasing the number from one to ten. 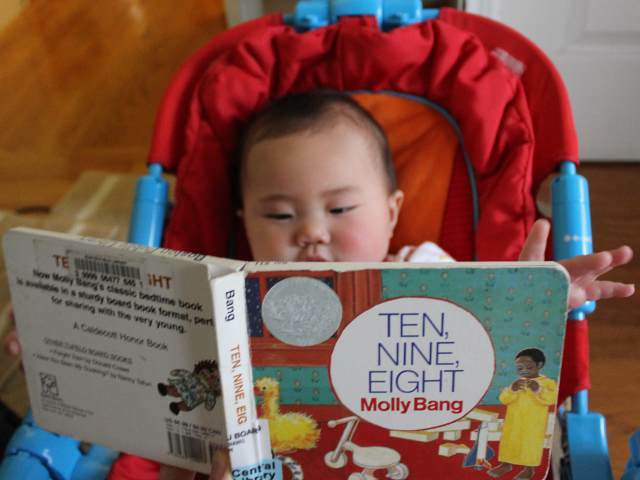 Ten Nine Eight by Molly Bang uses the same format in reverse. The book starts with ten objects and incrementally decreases the number until showing one item on the last page. 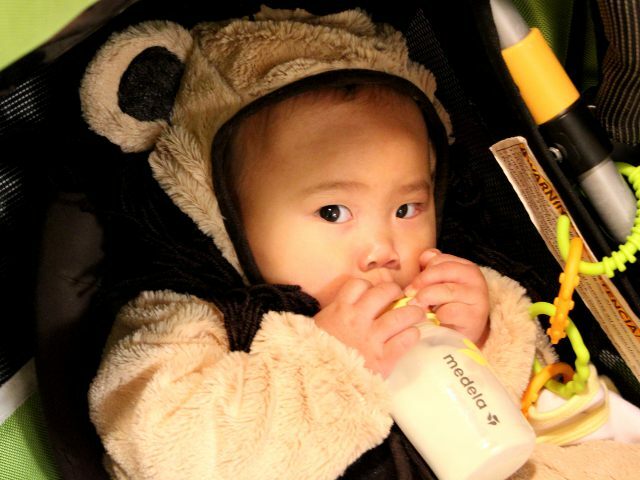 It wasn’t difficult for us to learn how to teach baby to hold a bottle. Teaching baby to hold a bottle on her own required a little patience on our part, but lots of interest and determination from our daughter. But after our experience with teaching baby to hold a bottle I am confident we will be able to teach any of our future babies to hold their own bottles as well.